Use Squish for iOS and Android to automate mobile App and Web testing on real Android and iOS devices and emulators. 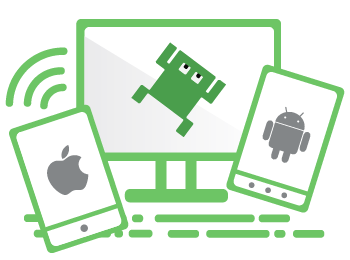 Solve your Mobile test automation challenges with Squish for iOS and Squish for Android. Squish features dedicated support for automated testing of native Mobile Apps, mobile Web Apps as well as a mixture of both. Due to Squish’s unique and stable object identification methods, Squish tests can run on mobile device emulators and different real devices without any changes. Unlike many other test tools, Squish does not require you to jailbreak or root the device. Instead, you can get started with automated GUI testing of your mobile Apps right away! Automate the tests for your Mobile Apps on a desktop environment using Android or iOS Emulators. Without any changes, these tests will also run on different, real physical devices. Benefit from device clouds offering access to a wide range of different, real mobile devices. Squish’s network transparent architecture and simple installation allows to easily move Mobile UI tests into any device cloud. Squish comes with dedicated support for all standard (buttons, text input, etc.) 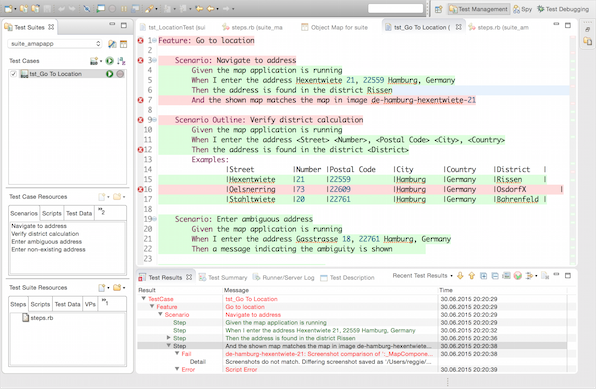 and complex (lists, tables, etc.) native Android and iOS controls. Custom controls are supported as well, either using native properties or using Squish’s unique integrated image search. Squish allows also fully testing of embedded Web/HTML5 content in your native Mobile Apps. Squish exposes the complete properties and methods of all GUI controls, models and other objects as well as custom properties and functions to the test script languages and the Squish Spy. This allows a test to look much “deeper” into an App for all kinds of advanced verifications. Squish supports the automation of standard gestures (touch, flick, etc.) as well as complex, multi-touch gestures using Squish’s unique Gesture Builder. Squish directly integrates leading DevOps tools including issue tracking tools such as Jira, CI tools such as Jenkins, Bamboo or TeamCity and test management tools such as HP ALM, Rational Test Manager or Microsoft ALM / TFS.. Benefit from the combination of Squish for Mobile Apps with other Squish editions to automate end-to-end testing of complex scenarios which involve several frontends and applications running on different platforms and devices. Click here to learn about more Squish features such as BDD (Behavior Driven Development) support, advanced verifications, distributed testing, and more.